What does Austria’s Presidential Election mean for Europe? The Austrian Presidency has just been won by Alexander Van der Bellen, a pro-eu independent and former leader of the Green Party. Mr Van der Bellen narrowly prevented the Austrian Freedom Party’s Norbert Hofer from becoming the European Union’s first far-right head of state. Is this the peak of support for far-right politicians in Europe, or just the beginning? This election has served once again to illustrate the deep divisions which exist in Europe, as well as the worldwide surge in support for anti-establishment political figures. The primary cause of this disenchantment with traditional politicians has been the migrant crisis, and well as the lingering effect of the great recession. These issues mean that politicians who advocate strong controls on immigration, are opposed the the euro, and are opposed to further integration are now more socially acceptable than they have ever been before. 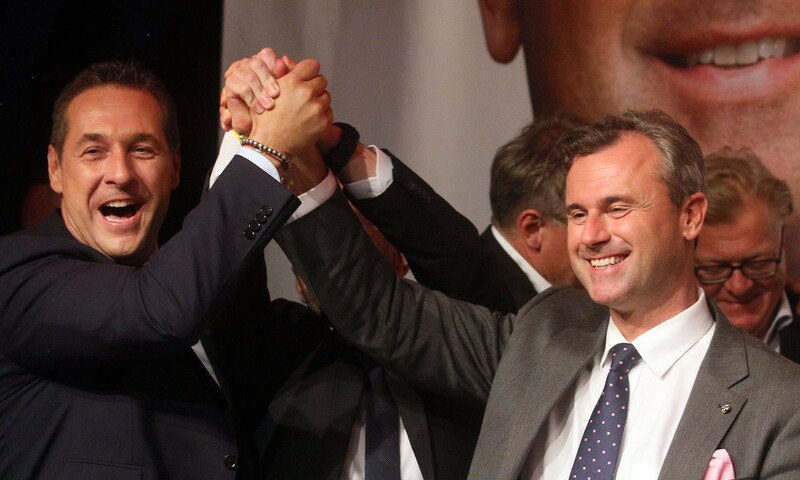 Taking Austria as just one example: Norbert Hofer and the Freedom Party of Austria won 35.1% of the first round votes in the Presidential election; whilst they went on to gain a total of 49.7% of the vote in the run-off election. In the previous Presidential election in 2010, the Freedom Party of Austria won just 15.24% of the vote. To increase your share of the vote by this extent is almost unheard of in modern European politics. Nobert Hofer (right), who almost became Austrian President (Photo: Ronald Zak/AP). The popularity of the Freedom Party of Austria is the latest in a trend of far-right candidates gaining momentum in elections across Europe. In December 2015, the Front National won 6.8m votes in French Regional Elections on a turnout of just 58.4%. In the 2012 French Presidential Election, turnout was 79.5%, suggesting that the Front National would be in line to gain a significantly higher number of votes in the 2017 Presidential Election. Indeed current polling has Front National leader Marine Le Pen consistently gaining around 27–31% support. This is significantly higher than the support shown for establishment politicians such as Francois Hollander, Nicolas Sarkozy, and Alain Juppe. It is indisputable that the Front National will reach the second round of voting in the 2017 Presidential Election. Indeed the Front National only failed to take control of any regions in the December 2015 elections as a result of tactical voting between The Socialists and The Republicans. It may well be the case that further tactical voting is required in order to prevent a Le Pen Presidency come 2017. The rise of the far-right movement in France is also mirrored in the Netherlands where Geert Wilders Party of Freedom (PVV) currently leads opinion polls in advance of next year’s general election. In Denmark, the Danish People’s Party (DPP) came second in last year’s general election, winning 21% of the vote; whilst the Swiss People’s Party (SVP) won the October 2015 Swiss parliamentary election with 29.4% of the vote. In addition, the rise of Golden Dawn in Greece; Jobbik in Hungary; and, the Alternative for Germany; shows that mainstream politicians should be increasingly worried about the popularity of the far-right. However, it is debatable whether it is truly the popularity of the far-right as an ideology that is driving the popularity of these movements. Of course, anger over the great recession and the migrant crisis has played its part; however in actual fact it seems likely that the main reason is the disenchantment felt by many voters towards traditional political parties. For example, in the United States, polling by Gallup in April found that 79% of respondents disapproved with the way Congress is handling its job. In the United States this dissatisfaction has manifested itself in the surge in popularity for anti-establishment Presidential candidates Donald Trump and Bernie Sanders. The surge in popularity for Bernie Sanders suggests that it is not simply the far-right that is gaining traction, but in fact all political parties who can be considered to be anti-establishment. In this regard it is worth remembering that the ultimate winner of the Austrian Presidential Election was previously the leader of the Green Party. In the 2010 Austrian Presidential Election, the Green Party did not even field a candidate, choosing instead to endorse incumbent Heinz Fischer the candidate of the Social Democratic Party of Austria. In conclusion, the Austrian Presidential Election serves to further illustrate the disenchantment of voters with traditional politics. Those who voted for Alexander Van der Bellen in order to prevent Norbert Hofer seizing victory should be applauded. Let us hope that a coalition of support from the centre-left and centre-right can also prevent Marine Le Pen from winning the French Presidency next year. Moderate politicians from around the world must not dismiss these results out of hand. They must do more in order to retain support or they will find that anti-establishment candidates truly become the norm in elections in the United States and Western Europe. Author jameswrigleyblogPosted on May 23, 2016 August 28, 2016 Categories European PoliticsTags Austria, EU Referendum, Europe, European Politics, European Union, Far Right, Politics, UK PoliticsLeave a comment on What does Austria’s Presidential Election mean for Europe?